Where are they now? Patty Kakak became friends with the Wellstones and recorded this tribute upon their deaths. Stand under the powerline now and you can hear its buzz. The giant towers march across the fields into the far distance, dominating the landscape. Stearns County, Minn. — The powerline crossed Virgil Fuchs' land, but not without one last fight. After workers had sunk cement footings for a tower in his field, he pointed out they were in the wrong place. He told the workers they were out of compliance with the state permit. So they cut off the top four feet of the footings and started to dig new set of holes. And Fuchs showed them where the permit said each tower got one set of footings, and no more. "I said, 'You can't put up another tower, you have your footings in my ground, and until you remove those old footings, you will not be putting up a new footings in here.' So I made them dig out the hole. They were down about 20 feet in the ground; they had to dig the concrete completely out of the ground before they could put up a new tower," Fuchs recalls. John Tripp remembers when the construction crews sank the footings on his farm. "The ground was sort of soft where they were doing it -- wet and mushy. And the trucks that they were using sunk in so deep, and it just sort of broke my heart to see them, just sort of plowing through, they were using bulldozers to pull the trucks through." When workers finally came to erect the towers, he wasn't there. "I didn't know that they were going to come to our farm that day, but Virgil did, somehow. So he took me to St. Cloud, without even telling me why, it was some pretext." "I think Virgil's very bitter," Alice Tripp says. "And John is, a little bit. But I'm not. I'm pretty mad at governments that listen to corporations instead of the people, but bitter? I don't know." "Oh, I guess I was sort of pleased at how people could get together and offer resistance to something like that," says John. "Politicians are probably going to be a lot more careful about how they go about doing something like this, and not just say, 'Get out of the way, we're coming through.'" When Philip Martin, the manager of the United Power Association, looks back, one thing he regrets is how company lawyers discredited the farmers who testified at hearings. The utilities knew that judges deciding the case would look over the hearing transcripts later. So they decided they couldn't let farmers' testimony stand unchallenged. Martin explained it this way to an interviewer from the Minnesota Historical Society. "When we said, 'What is your background?' And the guy said, 'Well I went to the eighth grade or I went to high school, and I farmed this or did this,' then we just kept saying, 'OK, and what makes you an expert?' And when that guy got done sitting up there, he was really a beaten individual. It's sad from the fact that you're really taking this guy's pride. You're taking this guy's stature." Martin was asked in a recent interview what he might do differently if he could go back in time and start the project over. He said he'd do what the company did the next time they built a transmission line in Minnesota. "We said, 'We've got to get a line from point A to point B. OK, we want a committee of people in that area. Where would it be, of the least inconvenience to you?'" he said. But if the power companies changed their approach, they also changed something else. "Do you know right now that there is a federal law that if you take a tower down that interferes with electricity flow from state to state, that it's a federal crime? And do you know why it's a federal crime? Because we got the federal government to pass the law. You know why? Because we couldn't get anybody from the state, in my opinion, to enforce the laws in the state of Minnesota," Martin says. You could say it was a time when an orderly society did not function, right here in Minnesota. And Martin would be the first to agree. And as for the question, who cares about that now? One answer might be, because it raises another question. What could make it happen again? A young Carleton College political science professor -- and future U.S. senator -- named Paul Wellstone wondered the same thing. Wellstone and another young Carleton professor, Mike Casper, wrote a book on the powerline struggle. They called it Powerline: The First Battle in America's Energy War. "What happened in Minnesota and why it happened may have a significance for our nation's energy policy far beyond the questions involved in building just one powerline," they wrote. "A potent new force -- rural Americans -- has something to say about what the energy policy should be and they may have discovered a source of power that will make all America listen," the two wrote. That didn't happen, though. Rural Americans did not rise up to change energy policy. 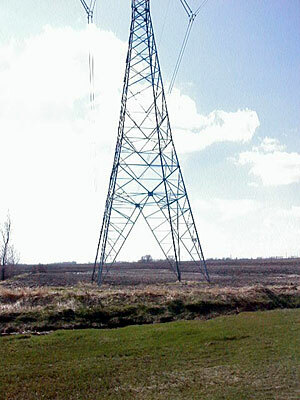 The Minnesota powerline struggle was not a sign of things to come. Maybe that was because a unique set of circumstances triggered it. Or maybe it was because the powerline fight came at the very tail end of the transmission line building boom. By the time the line went through, nationwide demand for electricity had leveled out after years of growth. But the fight did have some lasting effects. A few years after it, Wellstone became an energy advisor to Gov. Rudy Perpich. David Morris of the non-profit group the Institute for Local Self Reliance first met Wellstone then. Morris believes the powerline fight helped make Wellstone a strong supporter of alternative energy such as wind and solar, instead of centralized powerplants and big transmission lines. "He was until the day he died still heavily involved in energy policy in the United States Senate, and one of the things that he was fighting was the proposed energy bill that would have enabled more high voltage transmission lines, more long distance piping of oil from Alaska, more central power plants, a preemption of local authority, a preemption of state authority. All those things are in the energy bill, and Paul was opposed to all of those things. And so, 25 years after fighting at the localest of all levels, he was fighting at the highest of all levels, for the same things," according to Morris. Morris and others who met Wellstone then believe he also saw the powerline fight as an example of a grassroots movement of ordinary people trying to change the world. Patty Kakak, the folksinger who joined the movement against the powerline after she saw Alice Tripp arrested on television, met Wellstone through his work with the protesters. "This is what I remember him talking about in general, was how there was those in power, those who had the riches and the power often making decision that were good for them and ignoring the populace, the people out there who were who were doing the needy work. And he gave me sense that he respected people for what they did no matter what, whether you were farming and working hard in the fields or milking cows or if you were... even, he gave me a sense that art was important," says Kakak. Kakak had been working on her parents' dairy farm when she began singing for the powerline protest. Twenty-five years later, she's still a folksinger and composer of songs on the theme of social justice. George Crocker, the Vietnam war-resister-turned-powerline-protester, has spent the rest of his life working on energy issues and as a thorn in the side of the nuclear power industry. Alice and John Tripp and Phil Martin are retired. Virgil Fuchs is still farming.